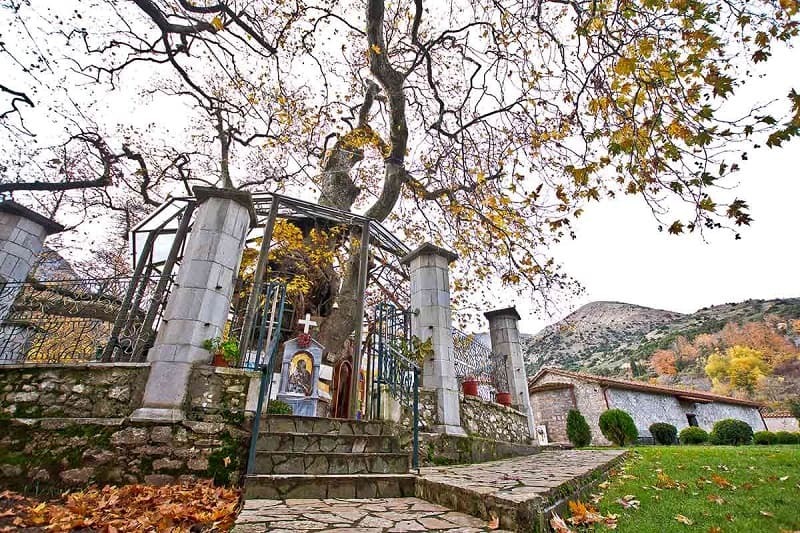 At the village of Plataniotissa, 30km northwest of Kalavryta, at a beautiful green location, is one of the holiest and most unique pilgrimages of Greece, Panagia Plataniotissa (All Holy Virgin of the Plane Tree) which is tucked inside the hollow of a large plane tree. 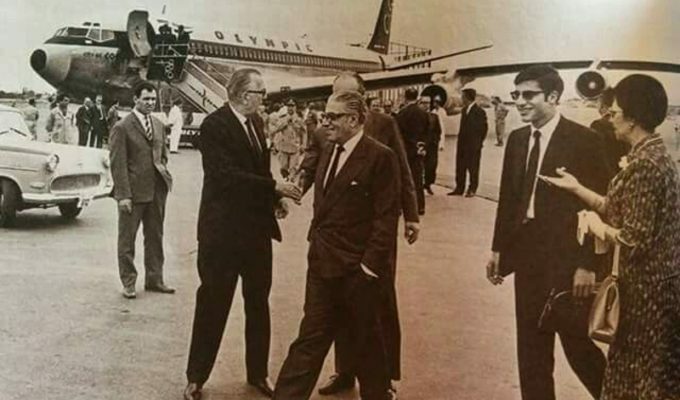 It’s a special and natural phenomenon which was created when three plane trees sprung together close to each other and over time united into one. These three plane trees are considered by the faithful as being an image of the Holy Trinity, while the four plane trees which surround them symbolise the four Gospels. 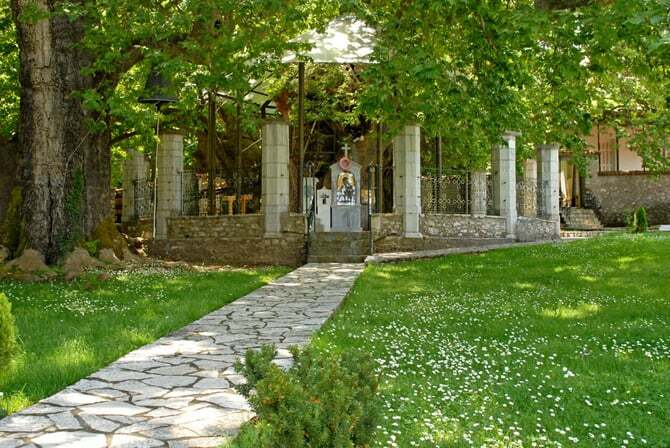 It is a very tiny church dedicated to the Birth of Panagia which has been shaped in the cavity of a huge, historical old Platanus tree. The tree has a base of around 16 metres and height of 25 metres and through time it has been joined with two other Platanus trees. 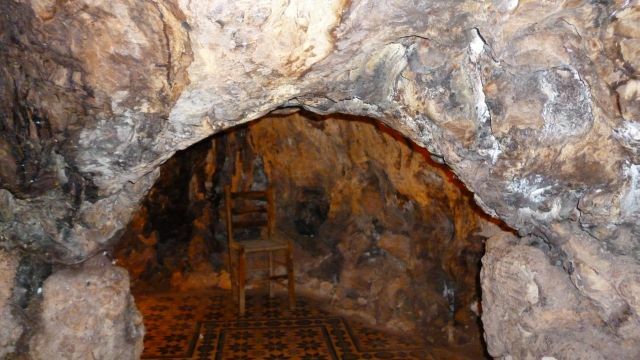 The date of the foundation of the church is not known, but its tradition regarding its history is connected to the Monastery of Megalou Spilaiou (Great Cave) and the icon of Panagia Megalospilaiotissa. The interior of the church, inside a natural cavity of the Platanus tree, you will find the depiction of the icon of Panagia holding baby Jesus. 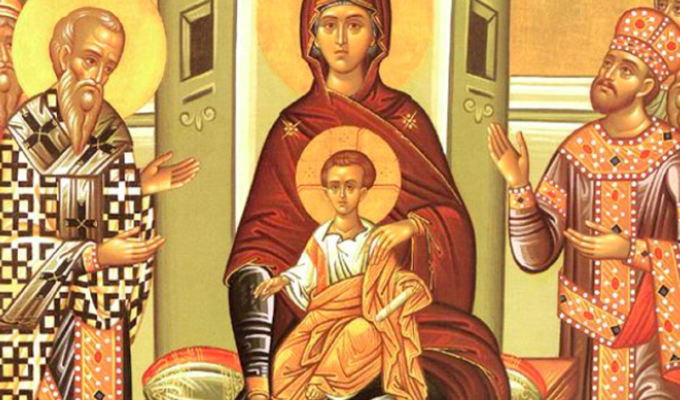 The icon is identical to the one at the Monastery of Megalou Spilaiou- it is actually identical but the reverse of it. 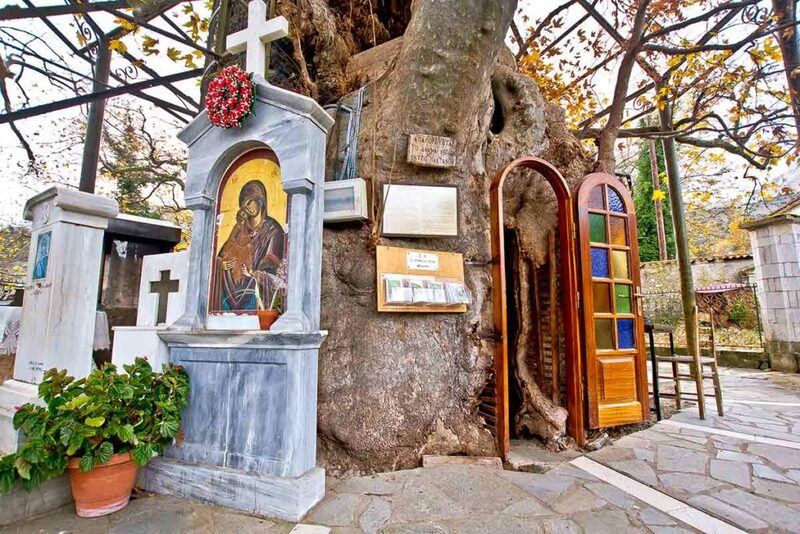 It is said that monks Symeon and Theodoros who had found the holy icon, were resting in this exact spot and decided to hide the Mega Speliotissa icon in the hollow of a plane tree to protect it. In the morning when the monks woke up, they saw a miracle as the spot where they had left the icon was now an imprint of the image in the hollow of the hard surface of the plane tree and this identical image was bathed in light. This remarkable phenomenon is preserved to this day and the chapel now resides in the hollow of the tree. 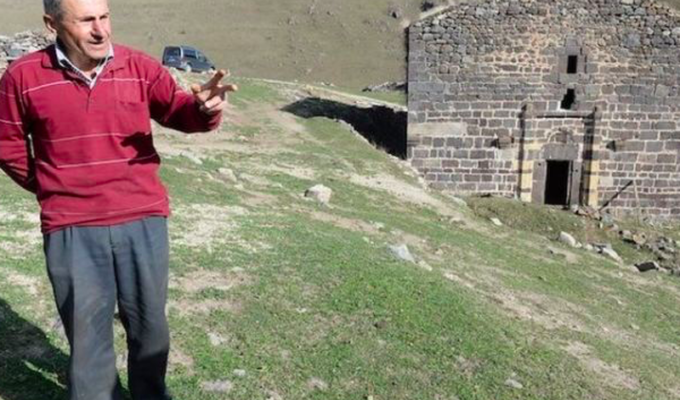 The church is around 8 metres long, and about 3 metres wide and can hold a capacity of around 20 people. A small entrance opens on its northwestern side, and a window is facing exactly opposite it. 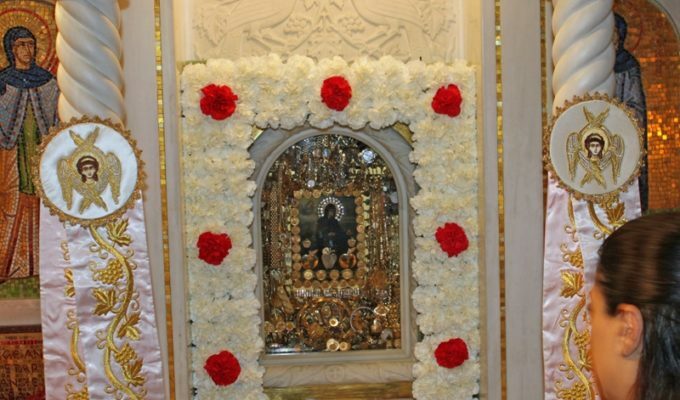 Inside there is a small screen with two columns that create the Holy Gate, while at a height of approximately 3 metres from the ground there is an icon of Panagia. Many miracles have occurred here for the faithful by the grace of Panagia, who has helped those in physical, mental and spiritual need.